Ursula Hargens is a ceramic artist and educator in Minneapolis. 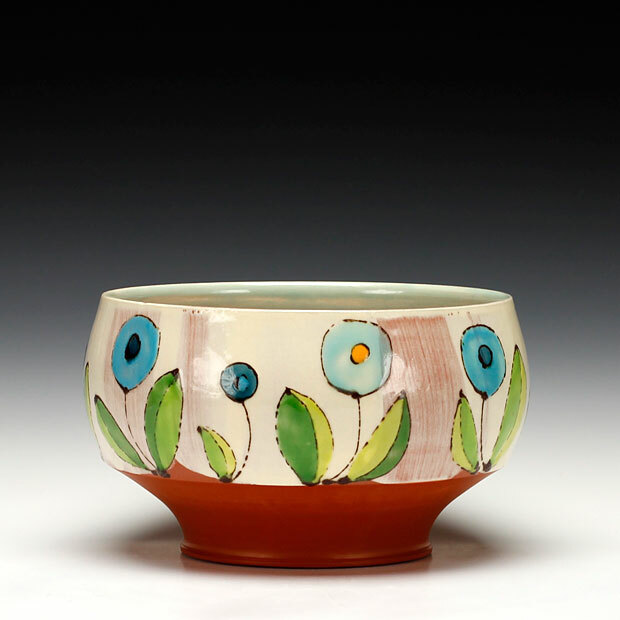 She received a MFA from the New York State College of Ceramics at Alfred University; a MA in Art & Art Education from Columbia University, Teachers College; and studied ceramics at Nova Scotia College of Art & Design. In addition to working as a studio artist, Ursula is co-founder and Program Head for MN NICE, an advanced certificate program in ceramics that she developed in collaboration with Northern Clay Center. She has also taught in community studios and universities throughout the country, including the University of Minnesota, Ohio State University, NSCAD, and Northern Clay Center. She has received additional awards from the Jerome Foundation and the Minnesota State Arts Board, and is a three-time McKnight Artist Fellow. My pieces are colorful and decidedly decorative. There is a painterly quality to my work produced by a physical layering of slips and glazes. Surfaces vary from crisp outlines to thin washes. Simple motifs unfold to create layers of color, pattern and image, resulting in rich, detailed surfaces. My work speaks of negotiated relationships. Flowers blossom, unite, and compete as they traverse my vessels, creating an active dialogue between form and surface. The botanical imagery in my tile compositions highlights tensions between the human and natural world—real versus imagined, native versus invasive, destructive versus regenerative. In both bodies of work, I strive to capture the intimacy and complexity of life. Layers conflict and coexist with one another. Relationships may be challenging, but they contain a unique beauty and rhythm. Confronted by a world full of conflict, I use my work to try to bring things into harmony and balance.